If you love making your own barbecue sauce but are never sure which one to use; try this Jack Daniels Tennessee Honey Barbecue Sauce for Beef, Pork, Chicken and Shrimp; it covers all the bases!! I can not remember a year when I haven’t made all of my holiday gifts for friends (children are another story…they don’t want my food; they want stuff!). Although I try to make something new each year there are repeats by request. This Limoncello is one of the most requested and I even get bottles back in hope of refills. Though not a food item I have legions of fans who love this Wood Butter for cutting boards and wooden utensils as much as I do. Can’ t buy a new cutting board? Refresh it! I’ve got a couple of new favorites I’ll be sharing this week…and this sauce has been deemed good enough to be first! I’m thinking this sauce is going to create the same sensation. A bit of whiskey, some heat too; it’s been great on everything I’ve tried; chicken, beef, pork and shrimp…it’s even good straight from the spoon (of course I did!). It was SO bitter cold last week that I just quickly seared some rib-eye on the grill, sliced it and then finished it inside on the stove; it was perfect, seriously. I used this Jack Daniels Honey Whiskey because I had some but don’t limit yourself; use your brand and add a bit more honey for a similar result. The folks making Sriracha Hot Sauce better get their act together because for some of us it’s a NECESSARY ingredient but if you don’t already have the red rooster or can’t find it; here’s a list on Wikipedia of other hot sauces you could consider! Sweet, heat, a bit spicy; there is that booze business too…what can I say but this Jack Daniels Tennessee Honey Barbecue Sauce for Beef, Pork, Chicken and Shrimp is oh SO good! A great gift for a cook or someone who loves to grill or what the heck, make it for yourself! Combine all glaze ingredients in a medium size saucepan. Bring to a boil and then reduce to a simmer and cook until slightly thickened over medium-low heat for about 10 minutes; stirring frequently with a wire whisk. « Imperial Pomegranate Cocktail – Perfect for the Holidays! Which flavor of liquid smoke do you prefer Hickory or Mesquite? 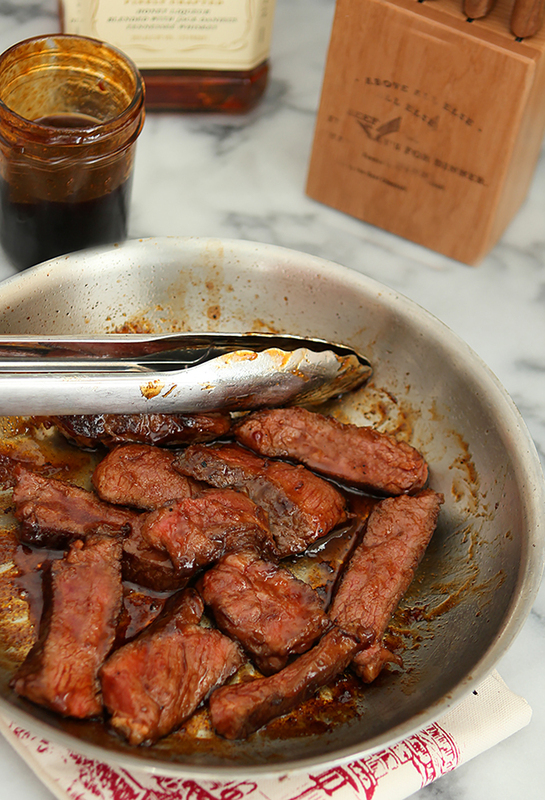 How long can you marinate steak in it? Yes, I use it for a marinade and/or a sauce…usually both though! It is so good! I just make sure to have a jar all season long; we’ll use it on anything, even grilled veggies! Can this be used as a marinade by not simmering it in the saucepan, but instead pouring it into a bag with the steaks? If not, then how about used as a glaze for bbq steaks? Sure you can use it as a marinade but if it were me? I would warm up the ingredients first and let them cool allowing the sugar and spices to meld better. Do the same thing to use as a glaze. Hope that helps…enjoy! Does it make a huge difference if I leave out the bacon drippings and hot sauce? Also, what is liquid smoke? How long can this be stored? Is it possible to can it? It lasted in my fridge for a couple of weeks; we went through it too fast to worry about spoilage; the alcohol does serve as a bit of a preservative. I’m not a canning expert; I would think it could be canned but I can not say for certain; maybe search for a canning resource and pose your question? Can this be canned with a waterbath? If not, how long can it be refrigerated? Sounds wonderful!! loooks soooo yummy! did you make that beef in the skillet? if so how did you make it?! What I did was briefly grill it; maybe 2 minutes per side. Then I brought it inside and let it rest a bit; then sliced it and finished it in a skillet with a bit of olive oil. I can better suit those who actually prefer a less rare piece that way; I just cook theirs a bit longer in the skillet and the others still get rare. Works for everyone! Oh yeah — this needs to happen asap in my kitchen. It’s become a staple here; it’s just that good! We have loved it; hope you do too! Just made this recipe and it tastes great, but a little tangy. Do you know how to cut the tang? Usually it would be a question of cutting vinegar in a recipe but several items in this recipe could be making it taste too tangy for you Vicki. Since my taste doesn’t experience that, it’s sort of guesswork but for future reference, maybe cut the vinegar to 1 tsp or eliminate entirely and possibly cut back on the espresso, ketchup or hot sauce. All of those have some acidity and could contribute. In the meantime I suggest adding a bit more sugar to taste (start with 1 Tablespoon) and cooking it on low for a bit longer; both should help to mellow out the flavor more. I love your gift of wood butter! I’m thinking that Ron has to try this sauce. Pinning to make later that’s for sure! Oh thanks for the reminder– I meant to make the wood butter last year and didn’t get to it. Maybe there is still time this week? This sauce sounds wonderful. I am giving my brother-in-law bbq grill accessories and I might have to make this sauce to take along too. I can think of so many meals I would love too use this bbq sauce in. Barbara, this sauce sounds amazingly good! Peter and I really enjoy a good BBQ/rib sauce, and your recipe is one I think I will try! Thanks for sharing. I like to mix them up a lot too but this one has been a winner Lizzy. We give mainly food gifts to adults, too. Everyone has too much stuff. We certainly don’t want more! Anyway, super sauce – great flavor. I *think* I read somewhere that the Sriracha folks had a solution and were working to implement it, but I won’t swear to that. Good post – thanks. I hope so; I am one who does always have the rooster in my fridge John. And yes…everyone I know has stuff; the food is appreciated; even anticipated and I find the making of gifts way more fun than shopping. Win win for all right? omg omg swooning! That sauce looks fabbbbulous and look at those ingredients! So worth my buying a bottle of Jack Daniels for this. It’ll keep ya warm in the winter, too. Oh gosh, I do love homemade bbq sauce. I’ve got a favorite recipe that I talked a friend out of years ago, but it would be nice to change things up and give this a try. It looks delicious. See, if you were my neighbor I would fill the jar! The jars and bottle are the most pricey part of the gift; I always appreciate them being returned.